Paris - the birthplace of photography! Images of this amazing city rarely become available, and when it does, it is usually of an individual building or a street scene. 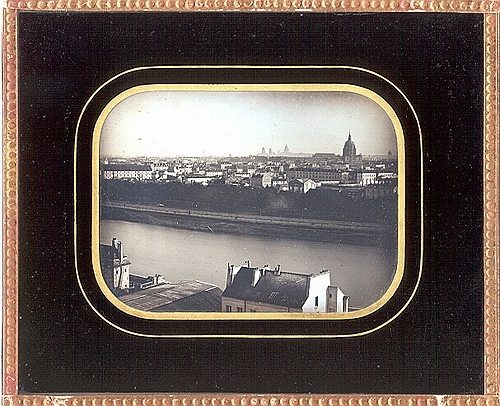 We are pleased to feature a magnificent quarter-plate daguerreotype that reveals an expansive view of Paris, circa 1850. This spectacular image provides detailed illustrations of many notable and historic buildings: the larger domed building on the right is Les Invalides; the domed building to the left is the Pantheon; and the twin towers further to the left belong to Saint-Sulpice. Finally, Notre Dame is seen in on the far left horizon. The immediate foreground offers a view of the Seine as well as the ordinary structures of everyday living such as houses, businesses, and churches. This daguerreotype appears to be laterally correct. Taking into consideration the position of the landmarks, the photographer would have likely have had to have been positioned between the bridge footing on the avenue Marceau and the Pont d'Iena, which is currently the avenue de New York. The image is in excellent condition with lovely tonal qualities. It is presented in the typical passe-partout presentation with a loop attached to facilitate wall hanging.